Using VLBA and the European VLBI Network, astronomers were able to accurately measure the distance to double-star system SS Cygni, resolving a major problem in the understanding of a class of stars that undergo regular outbursts. Sometimes astronomy is like real estate — what’s important is location, location, and location. Astronomers have resolved a major problem in their understanding of a class of stars that undergo regular outbursts by accurately measuring the distance to a famous example of the type. The researchers used the National Science Foundation’s Very Long Baseline Array (VLBA) and the European VLBI Network (EVN) to precisely locate one of the most-observed variable-star systems in the sky — a double-star system called SS Cygni — at 370 light-years from Earth. This new distance measurement meant that an explanation for the system’s regular outbursts that applies to similar pairs also applies to SS Cygni. “This is one of the best-studied systems of its type, but according to our understanding of how these things work, it should not have been having outbursts. The new distance measurement brings it into line with the standard explanation,” said James Miller-Jones, of the Curtin University node of the International Center for Radio Astronomy Research in Perth, Australia. SS Cygni, in the constellation Cygnus the Swan, is a dense white dwarf star in a close orbit with a less-massive red dwarf. The strong gravity of the white dwarf pulls material from its companion into a swirling disk surrounding the white dwarf. The two stars orbit each other in only about 6.6 hours. On an average of once every 49 days, a powerful outburst greatly brightens the system. 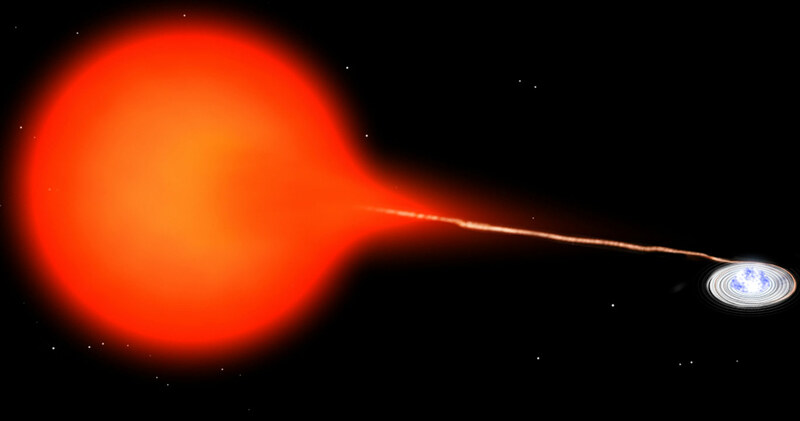 This type of system is called a dwarf nova, and, based on other examples, scientists proposed that the outbursts result from changes in the rate at which matter moves through the disk onto the white dwarf. At high rates of mass transfer from the red dwarf, the rotating disk remains stable, but when the rate is lower, the disk can become unstable and undergo an outburst. This mechanism seemed to work for all known dwarf novae except for SS Cygni, based on previous distance estimates. Hubble Space Telescope measurements in 1999 and 2004 put SS Cygni at a distance of about 520 light-years. “That was a problem. At that distance, SS Cygni would have been the brightest dwarf nova in the sky, and should have had enough mass moving through its disk to remain stable without any outbursts,” Miller-Jones said. The closer distance measured with the radio telescopes means that the system is intrinsically less bright, and now fits the characteristics outlined in the standard explanation for dwarf-nova outbursts, the scientists said. 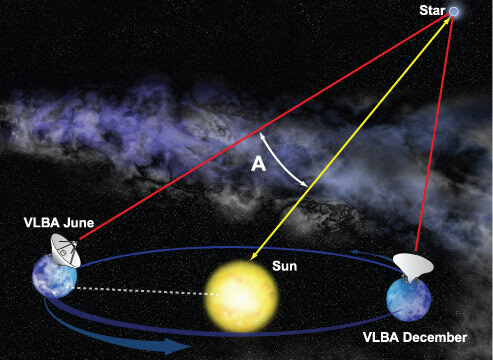 The astronomers made the new distance measurement using the VLBA and EVN, both of which use widely-separated radio telescopes that work together as a single, extremely precise, telescope. These systems are capable of the most accurate measurements of positions in the sky available in astronomy. By observing SS Cygni when Earth is on opposite sides of its orbit around the Sun, astronomers can measure the subtle shift in the object’s apparent position in the sky, compared to the background of more-distant objects. This effect, called parallax, allows scientists to directly measure an object’s distance by applying simple, high-school trigonometry. The astronomers knew that SS Cygni emits radio waves during its outbursts, so they made their radio-telescope observations after receiving reports from amateur astronomers that an outburst was underway. They observed the object during outbursts from 2010 to 2012. The difference in the distance measurements between the Hubble visible-light and the radio observations may have several causes, the scientists said. The radio observations were made against a background of objects far beyond our own Milky Way Galaxy, while the Hubble observations used stars within our Galaxy as reference points. The more-distant objects provide a better, more stable, reference, the astronomers pointed out. The radio observations, they added, are immune to other possible sources of error as well. Discovered in 1896, SS Cygni is a popular object for amateur astronomers. According to the American Association of Variable Star Observers, not a single outburst of SS Cygni has been missed since its discovery. It has been observed nearly half a million times, and its brightness variations carefully tracked, making it one of the most intensely studied astronomical objects of the past century. Miller Jones worked with Gregory Sivakoff of the University of Alberta and the University of Virginia, Christian Knigge of the University of Southampton in the UK, Elmar Kording of Radboud University Nijmegen in the Netherlands, and Matthew Templeton and Elizabeth Waagen of the American Association of Variable Star Observers, headquartered in Cambridge, Massachusetts. The researchers published their findings in the journal Science. 2 Comments on "New Distance Measurement of SS Cygni Resolves Major Astronomical Mystery"
So what’s the new distance?